Wakehurst keeper Marc Maybin attempts to collect a high ball during his side's midweek JBE League Cup tie at Ballyclare Comrades. Paul Muir believes his Wakehurst players must cut-out the “kamikaze” defending that has blighted the early part of their season. 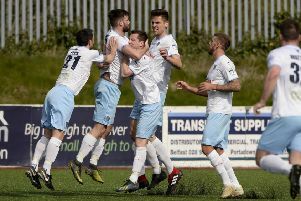 The Ballymena side are still looking for their first win of the season after two defeats in the past week. A 2-1 midweek loss to Ballyclare Comrades in the JBE League Cup was followed up by a 3-2 reverse by Dundela in Saturday’s Belfast Telegraph Championship Two encounter - the third time in four matches this term that Wakehurst have lost by a single goal margin. “It’s not the start we were looking for,” admitted Muir. “We have certainly been creating chances and scoring goals, but keeping them out at the other end seems to be an issue. “We certainly paid the price for some kamikaze defending against Dundela. “I’m still looking to make changes and I’m still negotiating on bringing some players in before the end of the transfer window,” added Muir. For the midweek League Cup tie, Muir took the opportunity to utilise full squad with Craig McCaughern, Corey Price and Jake Armstrong starting while there was a debut for Joe Morgan. After falling behind, a well worked move saw Tiarnan Rafferty and Jordan Foster combine for the latter to equalise. With a draw and a defeat from their opening two league games, Wakehurst were anxious to get points on the board against Dundela and in a move straight from the training ground, Lee McClelland - who played most of the match with a broken nose - opened the scoring with his first goal of season with wonder strike from 25yards into top corner. But the east Belfast side replied when they punished a poor clearance from Wakehurst keeper Macauley Cairns before hotshot Tiarnan Rafferty restored Wakehurst’s lead. However, Wakehurst contributed to the own downfall with some messy defending resulting in two goals for the visitors.